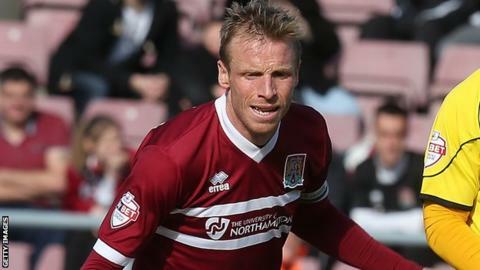 Northampton Town midfielder Ricky Ravenhill says he would would rather be in their team than any of their relegation rivals' for the run-in. The 33-year-old has helped the Cobblers to back-to-back wins and they are level on points with 22nd-placed Wycombe. Ravenhill told BBC Radio Northampton: "We've got a better squad and better belief than anyone else. "There's a lot of pressure on games and you need the experience of players that have been in these big games before." Ravenhill continued: "I wouldn't swap [for] any of our rivals' teams around the relegation zone. "The lads are upbeat but I think we were anyway. We've always believed we've got enough to get out of the situation we're in but the games are running out and it's great to get the wins." Northampton play Wycombe Wanderers at Adams Park on Good Friday, and welcome 16th-placed Portsmouth to Sixfields on Easter Monday. "It's a big game and they're ones I thrive on," said Ravenhill. "It's exciting. You'd rather be challenging at the top end but it's the same sort of pressure. "We definitely owe Wycombe one. It ended on quite a sour note with the way everything happened with Aidy [Boothroyd]. We didn't do ourselves justice." Hartlepool have lost their last five games and both 19th-placed Morecambe and Bristol Rovers in 21st have just one win in their last eight games. "I've never had a season where I've been mid-table and then got sucked down there and it's not something I'd want to be involved in," said Ravenhill. "They've thought they're safe and taken their foot off the gas a little bit, I'd imagine, and now they're looking over their shoulders and they're not in good form. I can't imagine it's a nice position to be in."